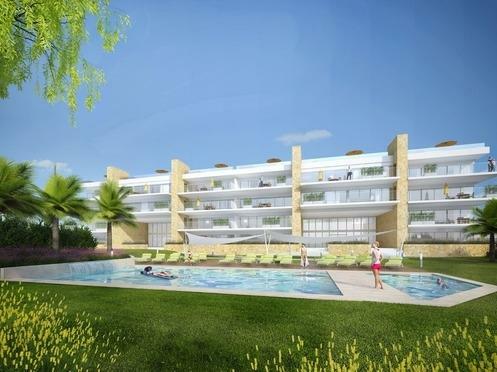 Luxury off-plan 2 and 3 bed apartments Albufeira - Property for sale. Full Description: Excellent opportunity to buy off-plan, these 2 bedroom apartments equipped with underground garage, communal pool and gardens and sea view! An exclusive product now in the 5th phase, presenting a condominium of 20 apartments in a very central and desirable location, a 10 minute walk from the beach and town centre but at the same time in a quiet location. Local amenities, shops, bars and restaurants very close by. A unique product on the market in Albufeira, superior quality, with beautiful contemporary architecture and bright interiors for maximum comfort. Built using the latest techniques, materials and state of art equipment, clearly adds to the investment potential along with the central location which makes these apartments stand out from the rest. With spacious interiors, large glass windows leading to huge terraces with pool, garden and sea views. Equipped with air conditioning, electric shutters, kitchen with Bosh equipment A+++. Each house also has a private underground parking space and storage. Possibility to choose between three options of available finishings/materials. Staged payments: 10% on signing of the promissory contract, 25% on completion of the infrastructure, another 25% with the beginning of the painting and the remaining 40% on the date of signing of the deed. Book your visit now! !